On Wednesday, I saw a few things that I really enjoyed seeing. I thought I’d share these here. The first involves a foal named Kindra. The reconstruction of the north boundary fence has received a lot of attention lately. I’ve had some really good questions from people lately, and so I have decided to put some more detailed information out on this topic. 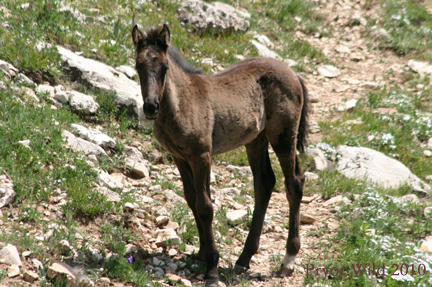 To better understand this topic, I’d first invite you to read an older post I did on the boundaries of the Pryor Mountain Wild Horse Range. This can be read by clicking here. Where is the north boundary fence? Why is the north boundary fence being rebuilt? I’m sorry for my delay in putting up this post on Stiles! Here are some photographs and information on Stiles from photographer Lynne Pomeranz and Sandi Claypool (of Monero Mustangs). Stiles has a 17 year old black and white mare named Pinta. He and Pinta are totally devoted to each other. In addition, he has taken in some other horses that don’t seem to have another band to fit into. We call them the misfits. He first took in Jefito, a two year old stud colt, and has been treating him as his son, teaching him to be a stallion. Then along came Kokoman and Bob the Donkey. He accepted Bob right away, but it took him a while on Kokoman. He seemed to feel that the four year old gelding might be a problem. All differences have been ironed out, though, and Stiles is very proud of his band. He recently also took in a yearling stud colt (Oops) that was in bad shape and came in for a while until he is on his feet. Stiles enjoys it when other young bachelors come by and visit and play. The young white bachelor Platadero is one that comes by, but Stiles always makes sure he doesn’t get too close to Pinta. We have so enjoyed Stiles and his easy going attitude. As you can see from the photos, his favorite pastime is eating! He is such a character, and so good and tolerant with all the other boys who hang in his band. Here are some recent photographs of Stiles that Lynne Pomeranz sent me. We were talking recently about how we missed seeing Stiles up here. We are very happy to know he is in such a great home, though. The Monero Mustangs sanctuary is a great place for wild horses like Stiles. It is also a lot of fun to visit, and I’d recommend it to anyone that is down in that area. For more information on Monero Mustangs, please click here. I answer many questions for people about the horses. Some of the more commonly asked questions relate to such things as good viewing areas, who individual horses are, and the like. Lately, though, I’ve been getting more and more questions that relate to some particular things people have heard about here in the Pryors. It culminated yesterday with someone asking me about things they had read about in a recent mailing they’d received. Based on all of this, I have a conclusion worth sharing: There are definitely some dramatic things being said about the current activities up here; and most, if not all, of these things are simply not true. I just really want everyone to know that there is a lot of this type of misinformation out there. There’s no real reason that this should be happening. In my opinion, it isn’t helping out with much of anything. In fact, I feel that it is actually hurting things. If you have any questions about what is going on up here, I’d invite you to ask. You can contact us here at the Center or contact the employees of the BLM’s Billings Field Office. There’s nothing being held back. In fact, up here we are really proud of the way many things are going; and we wish we were able to talk about them more than we do now. Thank you very much!